Pastor to McGlothen Temple Church of God in Christ for 22 years, from 1964 - 1986. Bishop Davis a product of McGlothen Temple accepted Christ and the Baptism of the Holy Ghost in 1949 at the McGlothen Temple under the leadership of Bishop McGlothen. He felt the Lord's call in 1952. He served faithfully under Bishop McGlothen for 16 years. He served 10 years as Junior Pastor of the Youth Department of the church and for six years as Assistant Pastor. Bishop E.E. Hamilton appointed him as Pastor in 1964. He founded Mt. Zion Church of God in Christ in 1972 and Pastored both churches until turning over the pastorage of Mt Zion to Elder Haven Butler and subsequently to Elder John Jennings. Bishop Davis also worked faithfully in other aspects of the church. 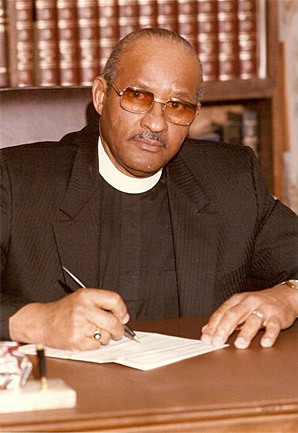 He served eighteen years as Superintendent of the Richmond District, Chairman of the State Finance Committee, Regional Superintendent in California Northwest Jurisdiction, Finance Chairman of the International Women's Convention and over four years as Administrative Assistant to Bishop Milton Mathis. He was elected Jurisdictional Prelate of California Northwest Jurisdiction in a landslide victory and was appointed to the office on September 23, 1985. He was consecrated at the 78th Holy Convocation of the Church of God in Christ by Presiding Bishop J. O. Patterson and was given the Ecclesiastical name of James, whereby naming him Bishop Clarence James Davis. Bishop Davis was a "HUMBLE" servant of God and the people. He was a praying man who recognized and respected the elder ministers. He loved unity and peace and would help you in any way he could. He was an anointed man of God and a humanitarian, always visiting hospitals and those that were shut-in. He was concerned about the conditions of the poor and underprivileged. He encouraged and trained many ministers and through his ministry many souls were saved. He was active in religious and civic organizations. He was a lover of people; especially the young and they loved him as well. He was a true businessman with outstanding leadership abilities, who believed in beautifying the House of God. His attributes included remodeling of the sanctuary to a new and updated version, remodeling of the dining hall, new carpeting, new lighting fixtures, new windows, new and comfortable pews, new dining hall, new organ and our first "Baby Grand" piano, replaced exterior church sign, the purchase of the first church van and the purchase of many parcels of land to be used for later improvements. Upon his unexpected home going he had plans to use the property next door for a Head Start Program, to begin a kitchen to feed the youth and blueprints to remodel the church, bringing the church and dining hall under one roof. In his love and concern for the young people he organized the first Youth Day, the 3rd Sunday of each month. He allowed and encouraged them to work in the church. Under his leadership the Youth Department flourished, eventually having their first ever Youth Congress. He took them on outings each year, even traveling to Reno and Las Vegas, Nevada. Not only was he concerned with their natural side, but he was most concerned with their spiritual, so at the start of each school he would have a "Back to School Revival" to prepare them spiritually for the upcoming school year. Many of the young people were saved in those revivals and today are Pastors, Preachers, Missionaries and Evangelists. The young people loved, respected and admired him with the highest regards. Bishop Davis lives on in the hearts and minds of those who had the privilege to serve under him. He is gone but will never be forgotten.